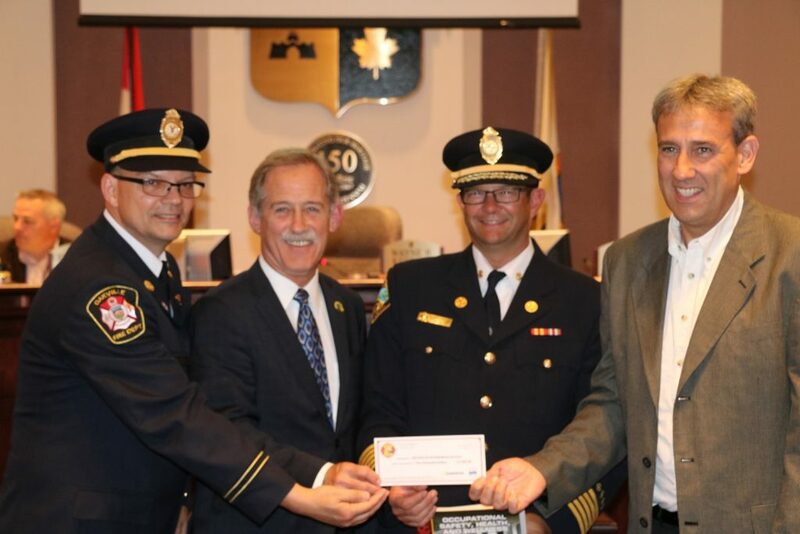 PHOTO (Left to Right): Gary Laframboise, Fire Marshal’s Public Fire Safety Council, Mayor Wayne Redekop, Fort Erie Fire Chief Larry Coplen, Henry Timmers, Enbridge Gas Distribution. MEDIA RELEASE – Enbridge Gas Distribution is partnering with the Fire Marshal’s Public Fire Safety Council to help Fort Erie Fire & Emergency Services purchase firefighting training materials. “Safety is a priority at Enbridge and we are proud to support Ontario firefighters who share in our commitment to help keep our communities safe,” said Henry Timmers, Enbridge Gas Distribution. Project Assist is a program that supplements existing training for Ontario volunteer and composite fire departments in the communities where Enbridge operates. This year’s $100,000 donation will be shared by 20 Ontario fire departments, including Fort Erie Fire & Emergency Services. Funds will be used to purchase educational materials for firefighters to enhance life-saving techniques. Since the launch of Project Assist in 2012, 84 Ontario fire departments have received additional firefighter training. The Fire Marshal’s Public Fire Safety Council (Council) is a registered charity established in 1993 with a mission to help create “a world where no one is hurt by fire.” The Council, chaired by the Ontario Fire Marshal and supported by the Office of the Fire Marshal and Emergency Management, promotes fire prevention and public education through sponsorships and partnerships with various groups and individuals with an interest in public safety. The Fort Erie Fire & Emergency Services consists of five volunteer stations throughout the municipality. Each of the five fire halls is run by volunteer District Chiefs in conjunction with the Fire Chief. Its mission is to protect life, property and the environment in Fort Erie through education, prevention, investigation, training, rescue, fire suppression, dangerous goods containment and life support services.